Its Karen here with my Kennedy Grace post and today I have made a cheerful little card using the "You Inspire Me" stamp set. 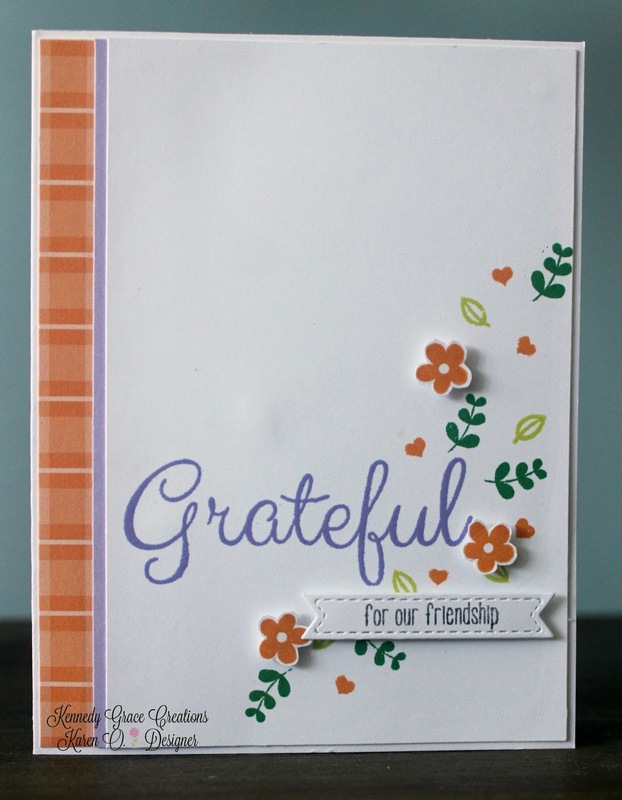 I used some of the little floral stamps around the Grateful sentiment. I stamped and fussy cut some extra little flowers and popped them up of foam before adding the "for our friendship" sentiment on top. A couple of strips of coloured paper to match the stamping to finish it off. A simple pretty clean and layered card using my new Stamp Perfect from Hampton Crafts. I have coveted a Misti from the first time I saw Kathy from the Daily Marker use one a long time ago. I profess to being a real dummy when it comes to stamping I have to stamp the image several times before I get it right and sentiments...suffice to say I have screwed up many cards because of stamping a sentiment. But the mini Misti retails here for around $100.00, thats a lot right. When a local store advertised the new Stamp Perfect for half the price and free shipping I just couldn't resist. I will claim its the best $50.00 of craft tools I have ever spent. I love it and would never have been able to pull off a card like this without it. Love your Graceful card and that is a perfect moniker for it! I agree about the MISTI!! I got mine and then all my girlfriends were "borrowing" it until Christmas when their loving family got them one! Great tool and can't believe we stamped before owning one! Super tool!